Finding 'Beautiful' Symmetry Near Absolute Zero At the atomic level, things can be messy at room temperature — particles tend to jump around. But a group of physicists have found that if you cool things way down, and apply a magnetic field, some quantum particles align in elegant symmetrical arrangements. 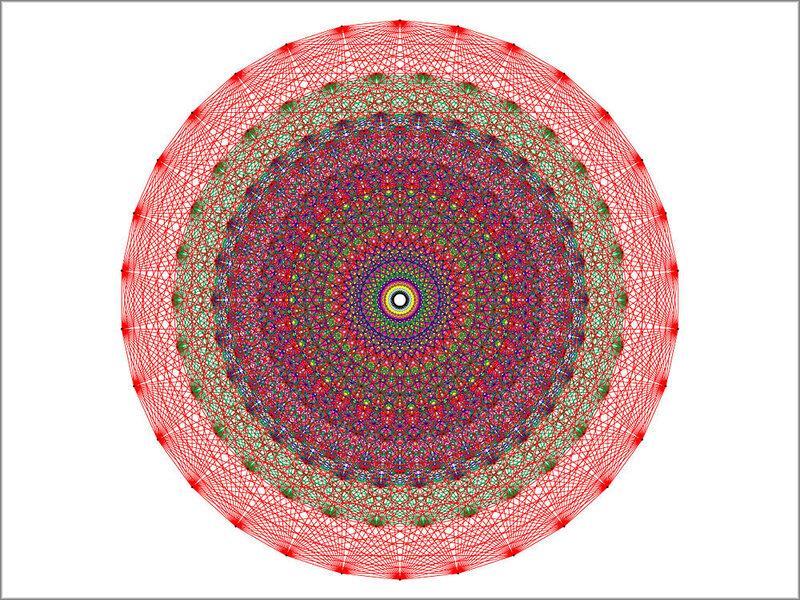 A two-dimensional representation of E8 symmetry, the type of symmetry exhibited by particles in the study. There's beauty in the world of condensed matter physics, if you know where to look. Physicist Alan Tennant found it in the transitions between quantum states of cobalt ions cooled to temperatures near absolute zero and then subjected to high magnetic fields. Let me explain. To a condensed matter physicist, transitions occur when matter goes from one phase to another — for example, when water goes from ice to liquid. Tennant studies a different kind of transition, one that takes place in the quantum world. The quantum world is all about how single atoms of matter behave. And in the quantum world the states of matter are not at all like the ones of the world we live in. But there are transitions between these states. And at the Helmholz Center Berlin where he works, Tennant has the equipment to make those transitions occur. "At the exact point where you change from one state to another, that's where you get the really important stuff," he says. Some phase transitions are complicated and messy. But Tennant says the quantum ones he finds with cold cobalt ion are not. In fact, he says, they are quite beautiful. In fact, as they report in the journal Science, the order Tennant and his colleagues found was a kind of symmetry known as E8. E8 is one of a group known as Lie symmetries, first studied by 19th century Norwegian mathematician Marius Sophus Lie. A sphere is the simplest form of Lie symmetry. If you rotate it on any of its axes, it looks the same. But rotating something on its axis is just one kind of rotation. "There's more generalized notions of rotations," says Robert Konik, a condensed matter physicist at the Brookhaven National Laboratory. "For example, you can think about symmetries involving rotations in higher dimensional spaces." You can, but doing so is beyond the scope of this article. But there are places on the Web where you can learn more about that. The point here, as Tennant says, is that in the weird quantum world, under certain precise conditions, an order in nature emerges that was previously unknown. "When I started out I really expected that quantum systems would be somehow more complicated and somehow more confusing than the everyday world that we're familiar with," he says. "But every system that we've looked at has turned out to be elegant; it's turned out to be truly beautiful."